The consortium „Arhis (Latvia), Spetsproektrestavratsya (Russian Federation) and SBV Architetti Associati (Italy)” won the tender for Consultant services for Preparation of Research and Design Documents and Technical Part of Prequalification and Bidding Documents for Restoration of the Cultural Heritage sites in of the Cultural Heritage in the Novgorod oblast: “Former Noble Assembly Building and Travel Palace in Korostyn”. The project is being implemented by St. Petersburg Foundation for Investment Projects (FISP) acting on behalf of Ministry of Culture of the Russian Federation within the programme “Preservation and Promotion of Cultural Heritage in Russia” financing by International Bank for Reconstruction and Development (IBRD). The selection of Consultant was done from 2013 till autumn of 2014. Due to strained political relations between European Union and Russian Federation the Consortium couldn’t manage registration activities till the deadline defined by the Client and was forced to withdraw from the list and pass the contract rights to the next candidate. The consortium „Arhis (Latvia), Spetsproektrestavratsya (Russian Federation) and AIG (Latvia)” won the tender for Consultant services for Preparation of Research and Design Documents and Technical Part of Prequalification and Bidding Documents for Restoration of Pskov Kremlin: “Varlaam Corner (towers and walls of the Roundabout town) and Postnikov’s Courtyard cultural heritage sites in the city of Pskov” . The consortium „Arhis (Latvia), Spetsproektrestavratsya (Russian Federation) and Architetti Giovanni Albera e Nicolas Monti Associati (Italy)” won the tender for Consultant services for Preparation of Research and Design Documents and Technical Part of Prequalification and Bidding Documents for Restoration of the Cultural Heritage sites in of the Cultural Heritage in the Leningrad oblast: “Vyborg Castle (city of Vyborg) and Priyutino Estate Museum (city of Vsevolozhsk)”. In October 2014 Arhis company signed the contract with Daugavpils City Council for the development of detail planning and concept design of a sports complex on the Vidzemes Street on the lake Shunu in Daugavpils. In accordance with customer requirements new sports complex will include a stadium with two 3,000 places stands. Sports complex will include athletics arena of 4 circular and 8 straight tracks, as well as sectors for the long and high jump, discus and shot throwing, stand for 500 seats, locker rooms, gym and multifunctional hall. Furthermore, sports complex will be equipped with 4 beach volleyball courts. 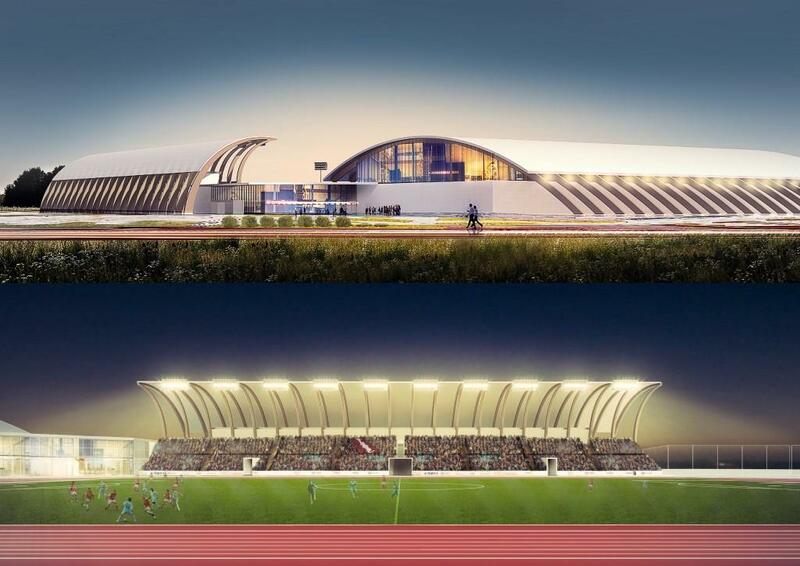 The sports complex design will be developed in accordance with the requirements of the International Association of Athletics Federations (IAAF). 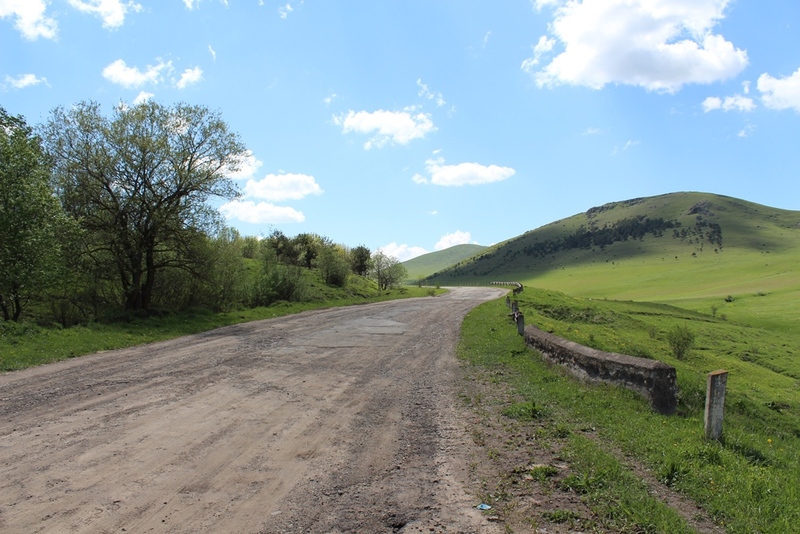 “Detailed design and supervision services for rehabilitation of the 6.8 km section of highway M3 in the Republic of Armenia” project implementation just started. According to the results of UNDP (customer) tender Armenian road construction company Chanaparh LLC gains the contract in cooperation with the Armenian company ADP LLC. Arhis LLC will carry out authors and technical supervision. Total project cost - 2,626,000 Eur. Construction start in August 2014 and will last for 13 months. In 2011 reconstruction project for the sports stadium in Vishki parish was developed. It was technical design for the land plot of 37500 m2. Project included dismantling of athletics field covering, asphalt, stairs, spectator tribunes and also the following construction works: building of the athletics field, soccer field, playgrounds and shooting-range storage facilities, commentator cabin and landscaping. According to plans of construction works to be started in next year company Arhis currently performs project actualisation. Started construction works under the reconstruction design project for JSC “Latvijas gaze” 3-storeyed administrative building on Kr.Valdemara Str. 24 in Daugavpils. Project was developed to meet the environmental protection requirements and consequently improve personnel labour conditions. Technical design includes reconstruction of existing administrative building with the replacement of engineering utilities, power supply system reconstruction, reconstruction of security and telecommunication systems, reconstruction of auxiliary building with domestic repair premises, parking lot construction and landscaping. 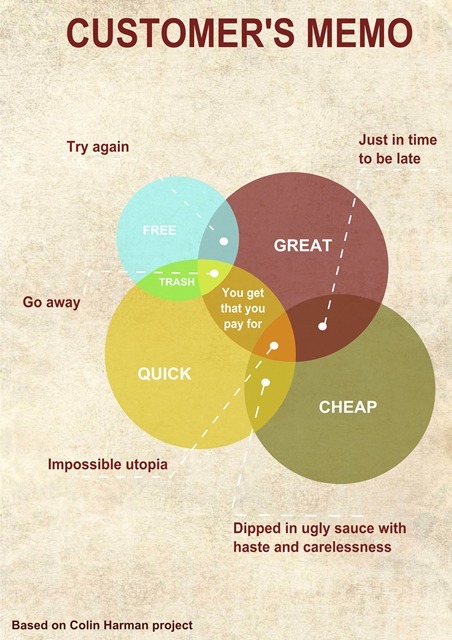 You may see the customer’s memo here . 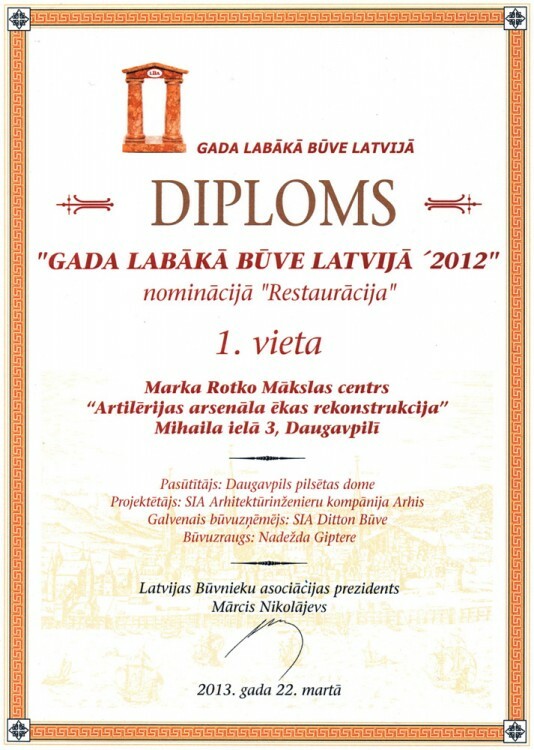 The 1st place in “Restoration” nomination of the “Building of the Year 2012” of the Latvian Builders Associations award took Arts Centre of Mark Rotko under the project “Reconstruction of former artillery arsenal”. Website was updated with a new section - brochures.